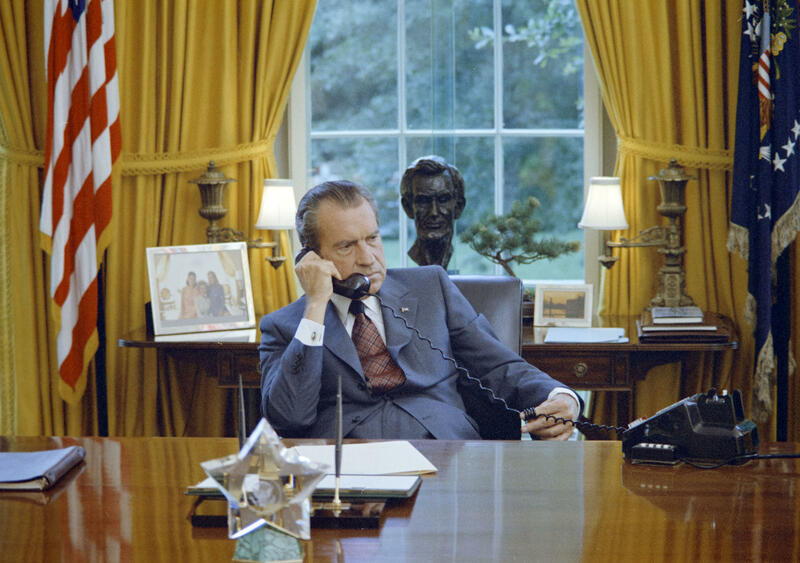 Richard Nixon on the phone in the Oval Office (Ollie Atkins/Richard Nixon Presidential Library. Luke Nichter is Professor of History at Texas A&M Central Texas. On this edition of the Nixon Now Podcast, we’re talking the Nixon Tapes again, with specific focus on President Nixon’s conversations about Daniel Ellsberg and the case of the Pentagon Papers. Our guest again is Luke Nichter, Professor of History at Texas A&M Central Texas. He’s the nation’s foremost expert on the Nixon White House Tapes, and founder of NixonTapes.org. Conversation White House Telephone 005-050. 13 June 1971. 12:18pm-12:42pm. Haig, Alexander; Nixon, Richard. Conversation White House Telephone 005-059. 13 June 1971. 3:09pm-3:22pm. Kissinger, Henry; Nixon, Richard. Conversation White House Telephone 005-070. 14 June 1971. 3:09pm-3:22pm. Kissinger, Henry; Mitchell, John; Nixon, Richard. Jonathan Movroydis: Welcome to “Nixon Now Podcast.” I’m Jonathan Movroydis. This is brought to you by the Nixon Foundation. We’re broadcasting from the Richard Nixon Presidential Library in Yorba Linda, California. You can follow us on Twitter @nixonfoundation or at nixonfoundation.org. Today we’re talking the Nixon Tapes again with specific focus on President Nixon’s conversations about Daniel Ellsberg in the case of the Pentagon Papers. Our guest again is Luke Nichter, professor of history at Texas A&M, Central Texas. He’s the nation’s foremost expert on the Nixon Tapes and founder of nixontapes.org. Luke, welcome back. Luke Nichter: Thanks for having me back, Jonathan. Jonathan Movroydis: We often hear about the Pentagon Papers. And to establish some definition for our audience, what were the Pentagon Papers? Who wrote them and what were its contents? Luke Nichter: Well, I think it’s a fascinating subject. And I want to preface a lot of my remarks by saying that, you know, this is a subject that as much as we’ve heard about them and people have a common recognition of the Pentagon Papers and Daniel Ellsberg and other names associated with him, I think this is something where we still don’t have a good history of any of this. And what I mean by that is, you know, there’s never really…you know, many of the records of the National Archives have never been released. They’ve just started that process in the Washington, D.C. area. And Daniel Ellsberg is still alive for that matter, I mean, he’s still active today. So I think we have long ways to go. But based on what we know so far, you know, the Pentagon Papers, that was a name given to them later. They started in 1967 and I recently interviewed, spent time talking to two of the living people who were involved at the beginning. So this was a project of the Johnson administration, specifically in the office of Secretary of Defense, Robert McNamara. And it started in a very different form. McNamara had a number of questions about the war up to that point. And I don’t know if the number was 100, but then the document became known initially as the 100 questions, and that McNamara drew up. I think he might have…came up with many of the questions on his own. And he assigned his staff, his office to work on the answers. He wanted answers to these 100 questions. And then as the project evolved, it was never planned to be a big, you know, massive comprehensive study, but that’s what it became. The McNamara study, it became 40 volumes, 7,000 pages or so. And the number of contributors were something like 35 or 40 contributors. The general editor was a guy by the name of Les Gelb and Daniel Ellsberg was nominally involved in this, he contributed, I think, a very small section. I mean, just a very…while he’s the name most commonly associated overall with the Pentagon Papers. He was a very minor contributor to the Pentagon Papers study. It was compiled in the ’67, ’68, ’69 they were still wrapping up in early ’69. And I believe the final 7,000 pages were finished something like, you know, the opening weeks of the Nixon administration. So that it became known later as the Pentagon Papers because it was no longer called the McNamara Papers, or at one point it was called the Kennedy-Johnson Papers. But it became known later as the Pentagon Papers, because that was sort of a more inclusive label for the fact that it involved both Johnson officials as well as the Nixon officials. Jonathan Movroydis: You’d mentioned Daniel Ellsberg that he wasn’t the main figure behind the Pentagon Papers, but he’s sort of the name that’s sort of synonymous with its release. Could you tell us who Daniel Ellsberg was? Luke Nichter: Well, sure, in a thumbnail sketch, he was born in 1931. So that tells you he’s in his late 80s today and still active. He was a U.S. Marine. He was then an analyst for the RAND Corporation in the late ’50s into the mid-’60s, at its headquarters in Santa Monica. And RAND had a number of sensitive government contracts to produce research and papers, and he carried a top secret clearance throughout all this. He left RAND to go back to the State Department. He spent some additional time in Vietnam, working as a special assistant in the U.S. Embassy in Saigon. He went back to RAND in ’67. He was ultimately terminated from RAND in part during a kind of…he had a kind of metamorphosis, Ellsberg did, where he went from being very hawkish to being very dovish. That is to say he started to question the war by ’67 around the same time that other government officials did. He left RAND in ’70. Became a kind of per diem consultant and went to MIT. So I would say, you know, he was very bright. He had a very promising career ahead of him. He had an impeccable academic background. He had military experience. He had government experience. He was an analyst. Everybody thought the world of him. By the start of the Nixon administration, he was very quickly becoming very, very antiwar. General Haig: …but we can get a reading on it. President Nixon: By, well, Monday afternoon officially? Well, let’s wait until then. Fine. Okay. Nothing else of interest in the world today? Alexander Haig: Just very significant this goddamn New York Times expose of the most highly classified documents of the war. President Nixon: Oh that. I see. I didn’t read the story, but you mean that was leaked out of the Pentagon? Alexander Haig: Sir, the whole study that was done for McNamara and then carried on after McNamara left by Clifford and the peaceniks over there. This is a devastating security breach of the greatest magnitude of anything I have seen. President Nixon: What’s being done about it then? Did we know this was coming out? Alexander Haig: No, we did not, sir. There are just a few copies of this of the volume report. President Nixon: So let me ask you this though, what about Laird. What’s he going to do about it? I just start right at the top and fire some people. I mean, whatever department it came out, I’d fire the top guy. Alexander Haig: Yes, sir. Well, I’m sure it came from defense and I’m sure it was stolen at the time of the turnover of the administration. President Nixon: Oh, it’s two years old then? Alexander Haig: I’m sure it is and they’ve been holding it for a juicy time and I think they’ve thrown it out to affect Hatfield-McGovern. That’s my own estimate. But it’s something that it’s a mixed bag. It’s a tough attack on Kennedy. And it shows that the genesis of the war really occurred during the ’61 year. President Nixon: Yeah, that’s Clifford. I see. Alexander Haig: And it’s brutal on President Johnson. They’re going to end up in a massive gut fight in the Democratic Party on this thing. President Nixon: But also massive against the war. Alexander Haig: Against the war. Jonathan Movroydis: Luke, let’s unpack this a little bit. A few questions come out of this specific conversation. How were the Pentagon Papers ultimately leaked, just to kind of start off? Luke Nichter: Well, so this conversation occurred June 13th, 1971. And that was the very first day that they were leaked, that a portion of the Pentagon Papers were published in “The New York Times.” It was a process of about 18 months that led up to that. And this is part of the story that’s never been told. For example, the FBI was on to Ellsberg in sometime in late 1969 when he was a consultant at RAND and they had investigated…Ellsberg had had numerous citations for security violations, failing to lock things up that were classified, improper handling of classified material, taking things home. And the FBI became involved either in late ’69 or in January of ’70. Now, based on what Haig says in the call, the FBI must not have shared its findings with the White House because the FBI was definitely on to Ellsberg, had an active file going certainly as of January of ’70. And they were investigating it, they were interviewing it, including his kids who knew things about it, and presumably the kids passed back to Daniel Ellsberg, the fact that somebody was onto them. So Ellsberg obviously continued on the path he was on, even though he must have had some ideas that the FBI was on his tail. So Ellsberg, you know, his plan, I think, I mean, we don’t know some things. Nixon had a pretty good honeymoon on Vietnam in ’69. He said the right things, he was doing the right things. The first troops were withdrawn in the late spring of ’69. He met with Stew over the summer. And midway, he appeared to be on the right path on the war. The honeymoon on Vietnam kind of ended in the fall around September of ’69. When Congress came back from its August recess and really kind of sharpened their critiques of Nixon and the war. And by September, October, there were sort of full blown brawls on the hill over Vietnam. You have more senators and senior members of Congress calling for the end of combat in Vietnam. And Ellsberg even co-authors in “The Washington Post” an op-ed on October 12th of ’69, with 5 other RAND analysts, very critical of the war on general terms. I mean, these are analysts who carry top secret clearances and can’t divulge certain details. So he had made his turn and become more active. And in that fall of ’69 window, he was starting to take either…take them home or copy them on photocopiers at RAND making an illegal copy and taking his copy home. He had decided to make this available to leak it somehow. He offered it to members of Congress, including Senator Goodell, Senator Fulbright. And as far as we know, they didn’t want anything to do with it. They just wanted to stay out of this. He had offered it to the press. And they were also very slow to act. Because everyone understood this was a pretty hot thing to publish and make available. I mean, 7,000 pages. And it’s really a whole history of the war going back to World War II, with the French and American assistance to the French. It was classified top secret, all 7,000 pages of it were. So this was sort of unprecedented, and even in this day and age today when leaks of classified material enabled by electronic transfers and WikiLeaks have become more common, where large volumes of material can be easily leaked. So there was a long process that led up to this. And finally, “The New York Times” decided to start to publish it in installments. On June 13th, the date of this phone call where obviously…I mean, presidents don’t have time to sit around and read the newspaper from cover to cover, where Haig lets Nixon know that “The New York Times” has started publication. Jonathan Movroydis: Haig is, in his conversation, he says that they’ve been holding it for a juicy time. And I think they’ve thrown it out to affect Hatfield-McGovern. What is Haig referring to here? Luke Nichter: This is interesting because I’m not sure what to think about this. I think there’s some truth to it but there’s also some facts because what I’ve discovered is that the FBI had known about this for a while. I’m not sure he’s right about this. But he might be. So beginning with this, the end of Nixon’s honeymoon in the fall of ’69, more senators were calling for a withdrawal, for an end of the war, for a withdrawal of American troops, a unilateral withdrawal, and to allow… They frankly didn’t seem very concerned that the effects of the withdrawal probably would be the toppling of Saigon, our ally in South Vietnam and a takeover by the communists in the north. Their point, as far as I understand it, is primarily end the war as quickly as we can. And the concern was for Americans, not for South Vietnamese. One of the efforts on the hill that got the most attraction in terms of using senatorial procedure to try to end the war was co-authored by two senators, Hatfield and McGovern. And in the 1970 fiscal year…so again, this all builds up after the fall of ’69. In 1970 Appropriations Act, they tried to tie in amendment named for them, the two authors, Hatfield-McGovern to cause an immediate end to the conflict as of the end of the year 1970. That didn’t work. It faced very strong bipartisan opposition. You got to realize Lyndon Johnson is still alive and a lot of his people are alive. There was bipartisan push back against this because, of course, Johnson faced a lot of criticism for the war too and he was eager…this was an issue that the Nixon White House and the Johnson folks worked closely together. And certainly their legacies to some degree were tied on the issue of Vietnam. When it didn’t work in ’70, McGovern and Hatfield renewed the effort for ’71. And so that was coming up again. We were getting into kind of appropriations hearing seasons, his seasons in ’71. So the thing is that’s what Haig was referring to that, you know, for The Times to release this when they did would look bad for Vietnam and might give a boost to efforts like Hatfield and McGovern. But that also didn’t square with the fact that the government or at least the FBI had known, you know, this was bubbling near the surface for a period of time. Jonathan Movroydis: Let’s listen to the tape of the same day. This is between President Nixon and Dr. Henry Kissinger. This is after the Haig phone call. Henry Kissinger: And McNamara. So from that point of view it helps us, from the point of view of the relations with Hanoi it hurts a little because it sets forth the further weakening of resolves and the further big issues. President Nixon: I suppose The Times ran it to try to affect the debate this week or something. Henry. Kissinger: Oh, yes. No question about it. President Nixon: Well, I don’t think it’s gonna have that kind of effect. Henry Kissinger: No because in a way it shows what they’ve tried to do, I think they are mad at themselves because they had sort of tried to make it Nixon’s war but this massively proves that if it’s anybody’s war, it’s Kennedy’s and Johnson’s. So that leaves Democrats now pleading about where they went wrong or what we are doing wrong. This graphically shows that…who’s responsible for the very big mess? So I don’t think it’s having the effect that they intend. President Nixon: Well, you know, it may not have the effect against me. The thing though that Henry did to me is just unconscionable. This is treasonable action on the part of the bastards who put it out. Doesn’t it involve secure information and a lot of other things? What kind of people would do such things? Henry Kissinger: It has the highest classification. It’s treasonable. There’s no question. It is actionable. I am absolutely certain that this violates all sorts of security laws. President Nixon: What do we do about it? Don’t we ask…? Henry Kissinger: I think I should talk to Mitchell. Jonathan Movroydis: So that was Nixon and Kissinger and the Haig phone call too. But Nixon and Kissinger are talking again about Secretary of Defense, Robert McNamara, and how he commissioned the study and how it really affects the Kennedy and Johnson administrations, their legacies and it doesn’t impact the Nixon administration. At least that’s what they believe. But why do you think they cared about the release of this publication so much? Luke Nichter: Well, this is a fascinating problem that the Nixon White House had. I mean, as far as I can tell and I’ve talked to Les Gelb about this, you know, they were done editing the report. And, you know, it was in January…I mean, it was finished in the opening weeks of the Nixon presidency, but as far as I know, it didn’t involve any content or records from the Nixon White House years. It was published not by the Government Printing Office, GPO. But it was basically a self-published job because they didn’t trust anyone to publish it, the copies of it. And there were a very limited number of copies run. I mean, one did go to Nixon’s Secretary of Defense, Mel Laird. One went to McNamara who had gone on to be an official at the World Bank. And I believe he refused his copy. So it was very tightly controlled. The contributors, 35 or 40 contributors some were currently in government, some were formerly in government, some were analysts at places like RAND. Some were current or former military. Some were current or former intelligence officials. It was a broad range of contributors. But there’s no doubt that like the context of the study was pre-Nixon. It was really more about sort of, how did the United States get into Vietnam over the course of, say, you know, almost 25 years. I think Nixon in history has been tied to the Pentagon Papers in part unfairly, because he happened to be in power when it was leaked. Now, the other side of the story what the critics would say that Nixon should be tied to it because, you know, he either made a promise or at least led critics of the war to believe that he would end the war quickly. Now, you know, reasonable people, I think can debate what it means to end this war quickly. But certainly, by the fall of ’69, the critics were reaching, you know, a much greater level of concern. I think their hope that Nixon could have it resolved in the first year. And so certainly by ’71, Nixon was being attached more and more. And, of course, the longer the war did go on, Nixon was going to be attached to the actions of his predecessors, Johnson and Kennedy, who were largely responsible for the buildup and getting the United States into the war. So I think Nixon’s concern is, “First of all, I’ve got to preside over this mess.” And even if Nixon doesn’t want to defend the actions, the specific actions in the war of his predecessors, he’s going to defend the presidency from an attack on the presidency, which is what this is. It’s the challenge to the authority of the president to keep secrets. And so I think that’s the first issue. The second issue is dealing with criticism like Hatfield-McGovern and Nixon’s ongoing ability to conduct the war and manage the war as it went on. I think then you have a third issue which a lot of people in 1971 didn’t know about at all, which was…we have negotiations going on with North Vietnam…we’re still in the war that’s being documented in the study. We’ve got negotiations going on with China and the Soviet Union. And there’s a public aspect each of these negotiations for example the Paris peace talks are public in Paris with North Vietnam. But privately, it’s a whole another matter where talks are much more disciplined and where things really can’t leak and where trust has to be built up with both sides for the talks to continue. So Nixon’s other concern that he alludes to here in terms of trouble this could cause with Hanoi is if you’re negotiating with someone and something in the press causes you to change your mind or change a policy such as the Pentagon Papers could possibly do as this conversation was taking place. Then when you go to your next negotiating session with Hanoi or with Beijing or with Moscow, how are they going to believe anything you say? How are they going to believe you’re going to keep secrets? How are they going to believe that you’re not going to go back against your word? How are they going to believe that “The New York Times” isn’t going to get a hold of the next secret and broadcast it to the world? So I think operationally, in terms of ongoing policy, I think absolutely was what Nixon was focused on. Jonathan Movroydis: On that note, do you think he was all worried about the idea that a precedent for leaks could derail the China initiative? Could derail the summit with Moscow? Luke Nichter: On some other tapes, he does say that. I mean, of course, these are “what if” questions, so we don’t really know. It’s been said many times throughout the Cold War the Soviet Union didn’t quite understand that the U.S. press was independent. They thought at times “The New York Times” was a mouthpiece for the government. And, well, it probably is sometimes but in this case, I mean, this is clearly the press was flexing its First Amendment muscles against the Nixon White House. And so, I think it would take a sophisticated view on the part of Hanoi or Beijing or Moscow about what freedom of the press means in here after all. These are countries that didn’t have a freedom of the press. And so it’s hard to know exactly what they thought. I think to know for sure whether that was a true concern is we’d have to know the mindset of the leaders in Beijing, Hanoi, or Moscow at the time and I don’t think we really know that. But on other tapes, Nixon does say, “That is a primary concern.” Is it’s one thing to let top secret documents be printed in the press. It was another thing entirely for this to affect current and even future government policy. I think that, again, was the focus of Nixon’s concerns. Jonathan Movroydis: You had mentioned that as the war went on Nixon…there was a concern within the Nixon administration that his policies might have been connected with the Kennedy and Johnson administrations. Was there a fear? Was there an overarching fear that the release of these papers might erode public support for the war? Luke Nichter: I mean, that’s hard to say. I don’t think Nixon really focuses much on that at least according to the tapes. According to the evidence that I’ve seen. Now, on the other hand, anybody can look up Gallup poll numbers for Nixon. You can look up just kind of public sentiment at the time in ’70, ’71. These were rough years for Nixon. I mean, these were…I mean, other than the final, say, 13 months of his presidency in ’73-’74. ’70, ’71, this was probably the toughest time for him. I mean, it’s easy in 2019 to look back and say, “Well, come on.” I mean, a year later in ’72, he was re-elected in a 49 state landslide, one of the greatest landslides in American political history. But in ’70 and ’71, you know, whether you look at public sentiment, Gallup polls, just kind of whether his policies, his foreign policy were getting off the ground, it not only didn’t look like Nixon was going to win in a landslide, it didn’t look like he was going to win at all. And it’s around this time on some other tapes, Nixon talks about not running for reelection. He talks about not wanting to be the second president to be victimized by a war referencing Johnson’s decision in ’68 not to run for reelection, in part due to the public’s opinion over the Vietnam War. So these were pretty bleak days for Nixon and Kissinger in ’70, ’71 prior to the China initiative getting off the ground that summer, prior to SALT I taking off later in the fall of ’71. Prior to really the spring of ’72 in the Easter offensive, really making headway with negotiations with North Vietnam to get us out of the war. You have to look at in the context of the time where this kind of hits Nixon at a low period. Jonathan Movroydis: Some historians have suggested that Nixon could have been concerned about the leaking of other classified information detrimental to him and his administration after this leak of the Pentagon Papers. Do you believe there’s any credence in this allegation? Luke Nichter: Well, I think there’s absolute credence to the fact that you can hear it in the Haig conversation. You know, here it is. You have the June 13th issue of “The New York Times” right on the cover. You can look at the cover, you can go look at it today on “The New York Times” website, “The Times” machine and pull up the exact image of the front page. And above the fold, there are two major stories. On the one side of the paper, it’s Tricia Nixon’s wedding to Ed Cox, the previous weekend at the White House. And the image of her in her gown. And then the other part is the first installment in this leak of the Pentagon Papers is being published on the same day. I mean, what a day for news on the front page of the paper. And so I think there’s a very legitimate concern for Nixon. You can hear it in that conversation with Haig where we need the facts and it’s clear they don’t have the facts. This catches them by surprise. Again, even though, as I say, the FBI had it in their files, and in the FBI files that I’ve seen, the Air Force is aware of this and a few other agencies. I did some own internal investigations and either this information wasn’t shared with the White House or it was and it just wasn’t on anybody’s radar. It was overlooked in terms of importance until that blew up like a bomb on June 13th, 1971. So I think, first and foremost, there was a real panic for getting the facts. How many copies of this thing are out there? Who has them? What other things do they have? If they have this, how many other…RAND’s involved in all kinds of projects? MIT or Ellsberg was at the time was involved in all kinds of other projects for the government. So I think there’s an immediate concern for, “Who else has this?” And, “What else do they have?” I think it’s a very realistic reaction that Nixon has and I think that’s foremost in his mind. Jonathan Movroydis: The next audio is from the following day, Monday, June 14th, 1971. This is between Attorney General John Mitchell and the president and how to react to the news reports following the release. President Nixon: What is your advice on that Times thing, John? You would like to do it? President Nixon: Has this ever been done before? John Mitchell: A Publication like this or…? President Nixon: No, no. Has the government ever done this to a paper before? John Mitchell: Yes, advising of their… Yes we’ve done this before. President Nixon: Have we? All right. President Nixon: How do you go about it? You do it sort of low key? John Mitchell: Low key, you call them and then send a telegram to confirm it. President Nixon: Mm-hmm. And say that we’re examining the situation and we just simply are putting you on notice. President Nixon: Henry is on the other…he just walked in and I’ll put him on the other line. Go ahead. John Mitchell: Mel had a pretty good go up there before the committee today on it and it’s all over town and all over everything and I think we’d look a little silly if we just didn’t take this low key action of advising them about the publication. President Nixon: Did Mel take a fairly hard line on it? President Nixon: Well, look, as far as The Times is concerned, hell, they’re our enemies. I think we just ought to do it in any way. Henry, tell them what you just heard from Rostow. Dr. Kissinger: Rostow called on behalf of Johnson and he said that it is Johnson’s strong view that this is an attack on the whole integrity of government that if whole file cabinets can be stolen and then made available to the press, you can’t have orderly government anymore. And he said if the president defends the integrity, any action we take he will back publicly. John Mitchell: Well, I think that we should take this and do some undercover investigation and then open it up after your McGovern-Hatfield. We’ve got some information we’ve developed this to where these copies are and who they’re likely to have leaked them and the prime suspect according to your friend, Rostow, you’re quoting as a gentleman by the name of Ellsberg is a left winger that’s now with the RAND Corporation who also have a set of these documents. President Nixon: Subpoena them. Christ, get them. John Mitchell: So I would think that we should advise The Times we will start a covert check and after McGovern-Hatfield just open it up. President Nixon: Right. Go ahead. John Mitchell: That’s good with you? John Mitchell: All right. Sure, we’ll do. Jonathan Movroydis: That was John Mitchell calling the president and Kissinger joined that call as well. Luke, some of our audience I’m sure have seen, “The Post” starring Tom Hanks and Meryl Streep, who respectively play Washington Post managing editor, Ben Bradlee, and post owner, Katharine Graham. You hear in this audio Attorney General Mitchell say that they could advise The Times that they are breaking a statute in effect put them on notice. What does this ultimately mean for the Nixon administration’s policy on the publication of classified information to America’s top newspapers? First, “The New York Times.” And could you also talk a little bit about how “The Washington Post” got into this as well? Luke Nichter: Sure. So “The New York Times” spent a period of months engaging prior to publication on June 13th, 1971, the first of a number of installments from the Pentagon Papers. The Times went through a process of months of internal deliberations, of consulting with their general counsel, you know, do we do this? If we do how much can we publish? And I believe it’s correct that the General Counsel’s Office advised The Times not to publish. Well, they went ahead on June 13th. And the reaction of the Nixon administration was the Department of Justice sought an injunction against The Times against further publication of anything from the Pentagon Papers until the matter could be decided, you know, in the court. And after all, you know, once an unlimited number of papers start to publish these, surely the government can’t come after them all. I think that was the thinking. So the post started several days later, and the Nixon administration sought a similar injunction in Washington district court against the post in its decision so they couldn’t publish any further. And this is where the case gets interesting because the district court in Washington goes the other way. Not to say that the government has an unlimited right to publish classified information, but the court goes against the injunction. And so now you’ve got a split situation, and so it has to go to the court of appeals in Washington, and then ultimately, the Supreme Court in late June of ’71. And, you know, so ultimately, what happens is, you know, this film was made about the post, but it was really “The New York Times” that took a lot of the risk to start to get the ball rolling, I think, you know, there’s a saying in history that a lot of history is not for the past, its purpose is really for the present. And I think that could be the case with the film “The Post” because the film came out at a time when, you know, there were these comparisons being drawn between Nixon and President Trump, comparisons between their relationship with the media being contentious. And, you know, I think in my own view, you know, the film “The Post” came out at a time to boost “The Washington Post” and its role in the subject that it didn’t…I think, even if you’re on the side, if you’re a critic of the Pentagon Papers, you’re a critic of the war, you’re a critic of Nixon, to me, I think it really should have been The Times that was showcased. Because they were the ones that were really involved in this issue and did the difficult work prior to other papers that joined…I mean, the earlier papers decided not to publish. It was The Times that decided to pull the lever and start to print the Pentagon Papers. So the Nixon administration’s response is first to seek an injunction while the courts decide. Ultimately, you know, the case winds all the way to the Supreme Court. The Supreme Court decides this on June 30th of 1971 issues a very, very limited opinion where it…you know, so you have lots of issues involved here. Because you have the Espionage Act, you have the First Amendment, you have issues of government secrecy, you’ve got lots of really complicated issues all wrapped up in this. And as the court sometimes does, it issues a very, very limited narrow ruling. That basically said it agreed with lower court rejections of the injunction that the Nixon administration sought against publication. And it really tried to stay out of espionage, and treason, and First Amendment. And so this is then widely heralded as this dramatic first amendment case. That allowed almost an unlimited First Amendment, and almost unlimited ability of the press to publish classified information and just a stunning defeat for the Nixon administration. But if you actually read the very brief opinion, it’s pretty limited, and it’s kind of, more to me, saying that the Supreme Court just doesn’t really want to get involved. And it does allow The Times to proceed, but The Times itself doesn’t print everything. Even The Times would say that it didn’t publish what it thought were the most sensitive matters. So I think what actually happened has been remembered differently in kind of the public opinion and films like “The Post.” So as I said, I think the proper history of this, in a way, hasn’t really been written to, kind of, balance history. Because I think the details, there are a lot of details, and I think leaving them out not only is significant, but I think leaving them…including them makes it a lot more of, I think, a much more interesting story. Jonathan Movroydis: In this conversation John Mitchell said, “I think we should advise The Times. Put them on notice in effect.” And then he says, “We will start a covert check” And after McGovern-Hatfield just open it up. What is Mitchell referring to in terms of the covert check? Luke Nichter: Well, I’m not certain. My guess, you know, rereading it a couple times and listening to it is what he’s trying to do is…you know, so it’s based on a couple of ideas. So if the assumption is that “The New York Times” and other Newspapers are publishing excerpts in the Pentagon Papers to, A, Discredit the war and, B, boost the critics of the war on the hill, who are passing appropriations bills and possibly amendments like Hatfield-McGovern to suddenly bring it into American involvement in the war. I think, what Mitchell is suggesting is if they’re going to use us for political purposes, what we ought to do on our side is discredit that. And figure out, you know, how many people who are unauthorized have copies of this? How’s it been mishandled? How is it already been used and misused for political purposes by Senators, by the press, by critics of the war? Conduct an investigation and then, you know, if this comes to pass as we think it might. In other words, if this is referenced in debates over the war, if this is referenced during another McGovern-Hatfield Amendment, which was presumably going to be introduced again as it was in ’70. Then if they’re going to go that route, then we’re gonna reveal what we found. All the ways this has been abused and mishandled by the critics of the war. So I think that’s what he means is start an internal investigation and just have it ready in case we need to use it. Jonathan Movroydis: In the last podcast, we talked about the concept of leaking during the Yeoman Radford affair. In recent times, both in the Trump Justice Department and the Obama Justice Department as well, we see aggressive treatment of leakers. On that side of things, what does the Nixon administration, how do they want to handle people like Daniel Ellsberg? Do they decide to prosecute them? Do they decide to leave this alone? How were the leakers treated within the Nixon administration? Luke Nichter: Yeah. I mean, this is the most prominent one, you know, not just during the Nixon’s year. I mean, you could go there, there was Beecher leaks, and there were more Radford leaks. I mean, it seems like in the modern day and age, and by that, I guess you could say, since the Cold War, since the invention of the modern photocopier since that’s where a lot of these things get duplicated, in the modern age, it seems that this is an increasing issue for every president regardless of where they sit politically, regardless of political party. And I think each one is kind of unique. I mean, even as precedent is built, you know, you look at some of the big ones, whether it’s Chelsea Manning, it’s Edward Snowden, I mean, they all have kind of unique elements to them. And so at least in the case of Ellsberg, so after the Supreme Court decides that the injunctions can’t stand and that the pressers have at least a limited right to publish information about the war, even if it’s classified, there were charges filed against Ellsberg to try to make him personally responsible. See, in these conversations we listened to, they suspect Ellsberg is involved. But they don’t know that he was the one who was, not the only one, but probably the leader of a group who ultimately, you know, leaked the copy that “The New York Times” published. So ultimately they thought there was a better chance, you know, don’t go after the First Amendment. Don’t go after the pressers. Go after Ellsberg personally. And so Ellsberg was…you know, he faced a possible 115 years in prison under the Espionage Act. The case went to trial in early ’73. And, I mean, the sentiment was…and I think American public sentiment was very divided then as I think now on these kinds of issues, on the one hand, I think many Americans believe in legitimate secrecy, but they also believe that secrecy can go too far sometimes. So, you know, the Pentagon Papers, I think, you know, are illustrative of the fact that people did start to believe the government had misled them about the war. But that, you know, there shouldn’t be a wholesale ability to steal government secrets to reproduce them, to sell them, etc. If we can do that, then what would stop someone like this? To me, I mean, how many degrees further is it instead of offering them to “The New York Times,” do you offer them to the Soviet Union, you know, or to another adversary around the world? So I think there are limits but it’s a real test of…you know, we all say that free speech is unlimited. We all like free speech. But how far can you go? I mean, you can’t yell fire in a theater. You know, there are certain things you still can’t go. There are customs, there are morals, and we can all disagree over what these things mean and how far we would go personally. But society still has to be regulated in some way. In the case of Ellsberg, they brought charges against him. The trial started in ’73. Ultimately it was unraveled. Now Ellsberg again in popular law this has been painted as he was found innocent. It’s more complicated than that. Once the trial began, the truth came out about the plumbers, this sort of internal White House investigatory team had broken into this like Ellsberg psychiatrist, Dr. Lewis Fielding. Then the second disclosure that Ellsberg had been, inadvertently, as far as we can tell picked up on some wiretaps of some other officials. And it wasn’t the fact that these occurred I don’t think the break in and the wiretaps, it was that the prosecution, the government, against Ellsberg didn’t share this information with the defense. And so, ultimately, the charges were dismissed against Ellsberg on account of…you wanna call it government misconduct, prosecutorial incompetence, or the fact that Ellsberg probably couldn’t have faced a fair trial. I mean, let’s be clear about that, anywhere in the country. So ultimately, the charges were dismissed against him because of the government’s conduct during the case when these other discoveries were made. So I think that’s how it was handled in this case. But, you know, again, you look at the others, Chelsea Manning, you look at more recently, WikiLeaks, Edward Snowden, you know, there’s precedent established each time but I think the precedent has limited importance, limited relevance even because the circumstances can be so unique each time one of these dramatic big leaks occurs. Jonathan Movroydis: Our guest today is Luke Nichter, professor of history at Texas A&M University, Central Texas. Our topic was the Nixon White House taping system as it pertains to the case of the Pentagon Papers and Daniel Ellsberg. Luke, thank you so much for joining us. Jonathan Movroydis: Please check back for future podcasts at Nixon foundation.org or on your favorite podcast app. This is Jonathan Movroydis in Yorba Linda.